Washington: Global growth has lost momentum since the start of the year, leaving the world economy in a “precarious” position, IMF Managing Director Christine Lagarde said. The global economy has weakened since the International Monetary Fund last updated its forecast in late January, though a recession isn’t likely in the near term, Lagarde said Tuesday in remarks prepared for a speech at the US. Chamber of Commerce in Washington. Lagarde characterised the slowdown as a “synchronised deceleration” during a panel discussion after her speech. In January, the fund lowered its projection for world economic growth, forecasting expansion of 3.5 per cent this year and 3.6 per cent in 2020. It was the IMF’s second cut in the outlook in three months. The fund will release its new World Economic Outlook with an updated growth forecast on April 9. “The global economy is at a ‘delicate moment,’” Lagarde said in her speech. Her warning comes as global finance ministers and central bankers prepare to convene in Washington next week for the semi-annual meetings of the IMF and World Bank. While confidence has been boosted by the Federal Reserve’s switch to a more patient stance and signs of a trade deal between the US and China, investors remain concerned the global expansion may be running out of steam a decade after the financial crisis. Lagarde said the global economy is set to benefit from the patience of major central banks, as well as increased stimulus by the Chinese government. The IMF predicts global growth will pick up “some” in the second half of 2019 and into 2020, she said. Still, that rebound remains vulnerable to a host of risks, including Britain’s exit from the European Union, high debt in some sectors and countries, trade tensions and “a sense of unease in financial markets,” Lagarde said. Given the state of the global economy, it’s important for policymakers to avoid missteps, she said. Monetary policy should remain accommodative where inflation is below target, while exchange-rate flexibility should be used as needed, according to Lagarde. Regulatory reforms aimed at strengthening the financial sector should continue, she added. The market power of corporations has been increasing, with the highest price markups being imposed by a “small number of highly dynamic companies,” a trend that is especially pronounced in the digital economy, Lagarde said. “I am not saying that we currently have a ‘monopoly problem.’ But I am saying that we should take appropriate measures — so that it does not become a problem,” she said. Lagarde reiterated her warning for countries to avoid imposing new tariffs on each other. An increase in tariffs by 25 percentage points on all goods traded between the US and China would reduce annual output in the US by up to 0.6 per cent, and up to 1.5 per cent in China, she said. 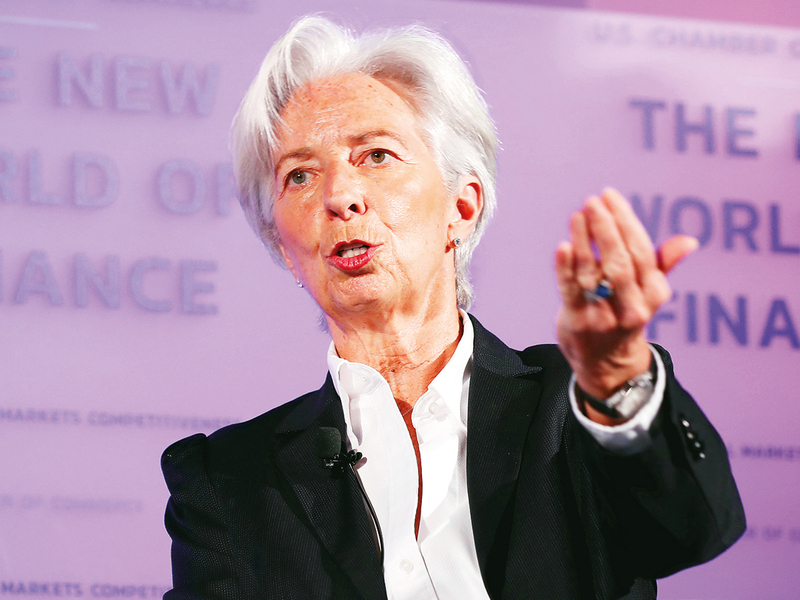 “These are potentially self-inflicted wounds that should be avoided,” Lagarde said. High-level trade talks between the US and China resume this week in Washington amid hopes the world’s two biggest economies can reach a deal to end their trade war.